A unique yet proved concept! In all cases you want to learn to speak the Dutch language fluently. You might have follow(ed) several language courses but keep struggling with your pronunciation. Or you just love singing and want to combine singing lessons with Dutch language learning. This is the right moment to join in at ZING HET, ZEG HET! (SING IT, SAY IT!). Singing is simply fun AND directly improves your fluency! You experience joy in learning, you learn Dutch words and phrases quicker and easier, you learn more about Dutch culture and you develop your presentation skills and the trust in yourself as a speaker of the Dutch language. 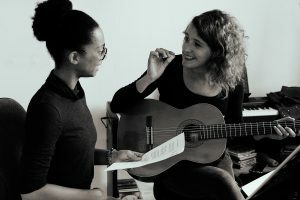 Dr. K. Ludke (conductor and lecturer at the University of Edinburgh) found that songs provide an excellent opportunity to improve your pronunciation, intonation and fluent, connected speech. In singing the brain is more completely activated (not only the cognitive parts) which makes the language cling deeper into you system. By singing in Dutch you naturally learn the ‘musicality’ of the Dutch language: it’s specific patterns of stress, rhythm and tone. This is essential to get your pronunciation fluent. Connecting speech to melody and rhythm significantly improves your vocabulary learning: songs help recognizing, remembering and reproducing words (Lukde, 2013). The melody serves as a memory hook. Songs provide real-life, in-context material: you hear and learn the language the way it’s used and spoken by natives. Learning to sing Dutch songs provides practice in listening comprehension which transfers into improvements in speaking skills. Music simply is an excellent memory technique! We learn and sing the Dutch songs together and I will train your listening, speaking and pronunciation skills by specific exercises. If you wish, exercises in grammar and writing can be easily added. Private classes as well as small groups (max 3 persons) possible. Also regular private Dutch language classes available. Privé NT2-taaltraining mogelijk.